This was James Dean’s most celebrated feature, although it was intended first only as a B-movie. The title was taken from an academic psychological study about alienated and disturbed youth – the Dean character, Jim Stark, uses flick-knives and drink as props, and the result is one of cinema’s great hymns to the glamour of brawling delinquency. To settle a contest over a girl called a ‘dirty tramp’, a chicken run is held. Two cars drive towards a cliff edge; the first driver to jump loses, but Dean’s rival cannot unlock his door and so goes over the edge. He loses more. 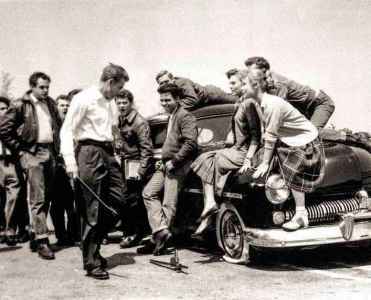 Dean’s car was a six-passenger 1949 Mercury Eight Club Coupe with a 255ci V8, favoured by George Barris and other hot-rodders. They cut-and-shut the bodies, filling the gaps with lead, a practice that led to the genre becoming known as ‘lead sleds’. A month before the movie was released, the 24-year-old Dean was killed in the Californian desert when his Porsche 550 Spyder collided with a 1950 Ford Tudor sedan that turned across his path. This lent Dean’s lead sled a certain sinister posthumous cultishness as a memorial to destroyed youth. The actual car is preserved in the National Auto Museum in Reno, Nevada. Alfred Hitchcock’s wife, Alma, chose the pretty, ice-blue metallic Sunbeam Alpine MkI for this masterpiece romantic comedy-thriller. It was the perfect fit for the beautiful, if chilly, Grace Kelly character. Her stylish drive along the Haute Corniche with an immaculately dressed Cary Grant as a composed, but very nervous, passenger is one of cinema’s great car sequences. Grant is John ‘the Cat’ Robie, a suave Riviera burglar with a taste for glamorous women and their expensive jewels. This Sunbeam was charming evidence of what an enterprising British manufacturer could do with great ambition but thin resources. While Kelly was scaring Grant out of his silk trousers with her spirited driving, Stirling Moss was doing high-speed publicity runs in an Alpine along Belgium’s Jabbeke highway. The name ‘Alpine’ also expressed some of the complex mix of exotic yearnings felt by the British during the grim days of post-War rationing. 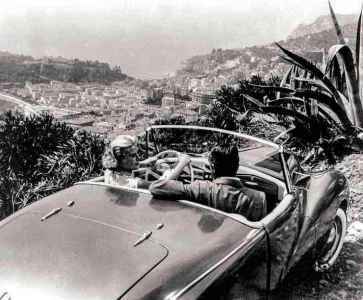 So influential was the film in creating a popular concept of Continental glamour, the views of Monte Carlo from the Corniche near La Turbie later became a visual cliché in car advertising. Thirty-seven years after the premiere, Grace Kelly died when she crashed her Rover P6 on very nearly the same stretch of road. In 1960 Federico Fellini released La Dolce Vita. To many, it is the greatest film ever made. To some, it is the greatest car film ever made. Marcello Mastroianni plays a struggling, disappointed journalist: the prototype paparazzo. He is ineffably cool, singlehandedly calibrating this behavioural temperature range. The quintessential scene involves a car. Anita Ekberg and Mastroianni are splashing at night in the Trevi Fountain, a symbol, very possibly, of sexual stuff to come. And they drove there not in a Lancia or a Maserati, but in a black Triumph TR3A with red upholstery, licence number ‘324229 ROMA’ on the nostalgic black plates. Mastroianni, fag hanging carelessly from his lower lip, liked the TR so much that he eventually bought one. In other scenes, Sylvia the ‘American film star’ drives a ’58 Ford Fairlane hardtop (left), while her boyfriend is in a ’56 Corvette. Elsewhere, there is a night race between a ’58 Thunderbird and an Alfa Romeo Giulietta. Everywhere in La Dolce Vita the symbolism is compelling. In the Home Counties, a TR3A would be driven to a Surrey pub by men with a taste for G’n’T, loose underwear and approximate dental hygiene. 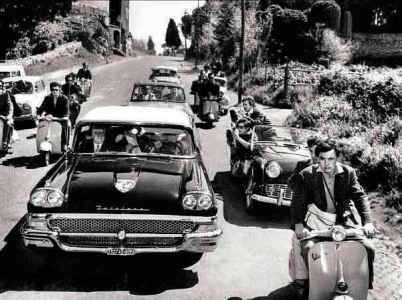 But in Fellini’s Rome, the Triumph symbolises ‘rebellious outsider’. And the American cars? To Fellini they represent exotic, louche sophistication. Possibly even depravity. Certainly, they establish a competition between New World Hollywood and Old World Cinecittà in this most brilliantly disturbing film. Many fine cars are consumed in this wonderfully good-natured caper. A Lamborghini Miura explodes on the SS26 near Aosta. For reasons of production economy, a Lancia Flaminia, disguised as an Aston Martin DB4 convertible, is pushed over a cliff, while one of the two Jaguar E-types is also damaged. The status of a Mafia capo is indicated by his driving a black Fiat Dino. But the film really belongs to the trio of Mini-Coopers. The ‘Cooper’ part is significant: not proletarian, but a little bit fast in every sense. The Mini was, it is always said, the first small car to be classless. Owning one simply said that you needed a small car, not that you were poor. 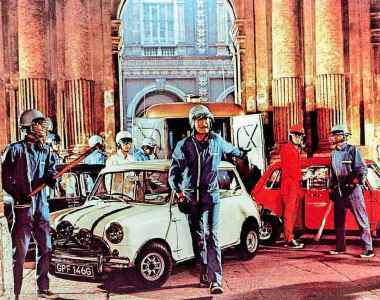 Thus the Mini was a perfect fit for Charlie Croker, the endearing Cockney villain played by Michael Caine, whose ascent from an impoverished East End to stardom was the best demonstration of high-speed social mobility during The Swinging Sixties. Fiat offered the producers a deal for product-placement, but the Minis were thought essential to project British character. Also projecting British character was Benny Hill, cast against type. Instead of a randy milkman, he plays a randy computer hacker charged with disabling Turin’s traffic lights. 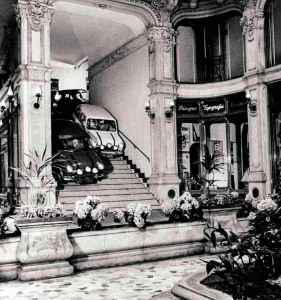 In the resulting chaos, the Minis do a gloriously choreographed and impertinent tour of Fiat’s home city, racing down the arcades of Piazza San Carlo and even performing some triumphal circuits of the pista on the roof of the Futurist factory at Lingotto. The sewer scenes were, however, shot in Coventry. Minis were already endearing before 1969, but The Italian Job confirmed their status as examples of peculiar British genius: technically advanced, but irreverent and amusing too. Michael Caine always plays engaging characters, but here he was upstaged by a car. A recent survey suggested that in the whole history of cinema, the most familiar car is a New York Ford Crown Victoria Yellow Cab. Manufactured between 1992 and 2011, it has featured nearly 5000 times in the movies. 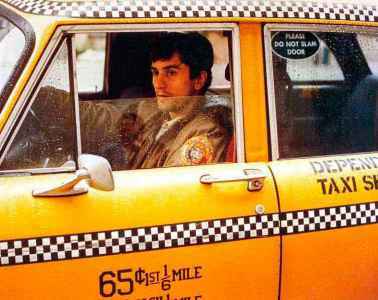 But the most famous cab of them all is the Checker driven by Travis Bickle, the Robert de Niro character in Martin Scorsese’s greatest film. In any city, the local cabs provide passengers with edited insights into local preoccupations. Just as the driver creates his own micro-culture, so the car betrays larger concerns. Bickle, a brooding, foul-mouthed and angry Vietnam veteran, sits in command of his own world, a scratched and yellow Perspex partition separating him from passengers sitting on bottom-polished dirty blue vinyl. The bespoke Checker was a US equivalent of the unique London black cab. Its origins were in a Chicago garage and taxi business owned by an entrepreneur in the schmutter trade. Bickle’s car is a 1974 A-series with a 350ci Chevrolet V8 grumbling through a three-speed auto ’box. During the production run from 1959 to 1982, the Checker A-series was all but unchanged. Many mourned its passing, a distinctive piece of American culture – crude, assertive, lovable – that succumbed to globalisation. In this way the Checker supported Travis Bickle, who looks through his wraparound windshield and sees a city in decline. Most Manhattan cabs today are Toyotas or Nissans. You wonder whether Bickle might have been right. The getaway driver is a neglected character in heist movies. Too often, the focus is on violent goons with pick-axe handles or guns. And in Baby Driver, the mastermind crim is played by a pre-Weinstein Kevin Spacey, in what could prove to be his last role. But here the getaway driver is the star. So too is his car. Director Edgar Wright began with an established stock formula, but, with genius, created something unique. For the getaways and chases, he insisted on uncompromised live-action on the streets of Atlanta, resulting in driving that is both violent and brilliant. The getaway driver is also treated to generous amounts of character development. Ansel Elgort is the youthful Baby Driver and, as with The Graduate, the soundtrack is a Simon and Garfunkel classic. 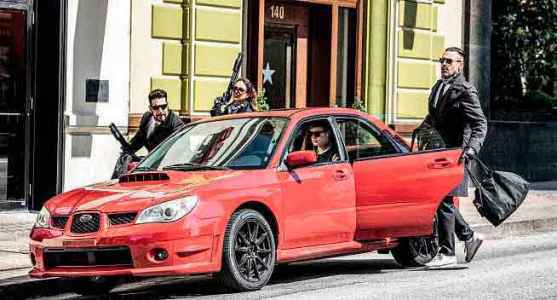 As if to explain Elgort’s intelligent, sensitive personality, the getaway car is an unusual choice for Hollywood: the goons have to squeeze into a Subaru Impreza WRX that provides scarcely enough space for their handheld arsenal, including an AR-15 assault rifle, Glock 26, Ingram MAC-10, Sig-Sauer P229 and a Mossberg Mariner. For some of the high-speed manoeuvres, including obligatory freeway lane-changing against the flow and two 180º turns in a narrow alleyway, the Subaru’s front-wheel drive was disabled, the better to achieve outrageous effects of handling. Of course, it is absurd to hobble so competent a car in this way, but great movies are not documentaries, rather lies that tell the truth. Who would want to see a getaway sequence of a car that behaves with great decorum and fine balance? And here is your answer to the story of all cars in cinema: they take you places never expected. And that, of course, is one definition of art. Whoa, whoa, whoa there, Sir! The best movie cars’ without Two Lane Blacktop’s 1955 454ci Chevy, the Christine Plymouth Fury, or even Smokey and the Bandit’s 1977 Trans Am (the movie that made Trans Am sales take off)? My favourite would be Dirty Mary, Crazy Larry’s simply wonderful ’1969 Dodge Charger 440, thundering its way across rural America. Maybe these films were considered too low-brow to be featured?